There is no better deal in Cleveland than the lunch buffet at Seven Roses in Slavic Village. For a price ranging from $8.99-14.99 you can eat your fill of hearty Polish food. I had eaten at the Seven Roses in Beachwood back in the day, and always try to hit their stand at local Oktoberfests because the food is good. Photo from Yelp user Stephen H.
Had I not read some of comments on Yelp, I would have been totally confused. We sat ourselves and waited a short time for someone to come out of the kitchen. An elderly lady came out and asked if we were having soup. Sure. She brought out 2 flavorful cups of cabbage soup and then asked “Pepsi?” Sure. 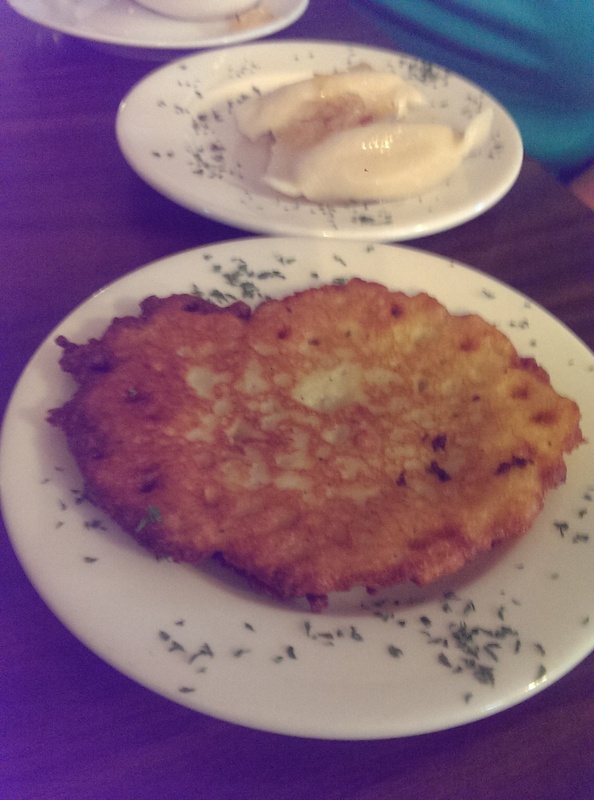 A bit later she brought out small plates of very creamy potato pierogi and a crisp potato pancake for each of us. (Ask for sour cream if you go, btw) We then helped ourselves to the buffet…because both this [Cleveland.com] review and Yelp told us they had one. Very good, as mentioned. When through, we were each brought a couple of pastries. I had a short conversation with the owner when I asked if there was vinegar in her soup. She asked if I’d ever had dill pickle soup. I hadn’t. When we went to the counter to get the bill, she had a quart container of some ready and gave it to me. Very sweet of her. We enjoyed lunch very much and for sure will be returning. Now you know the drill. Just nod, say “sure”, and enjoy. Now for the particulars of our visit. 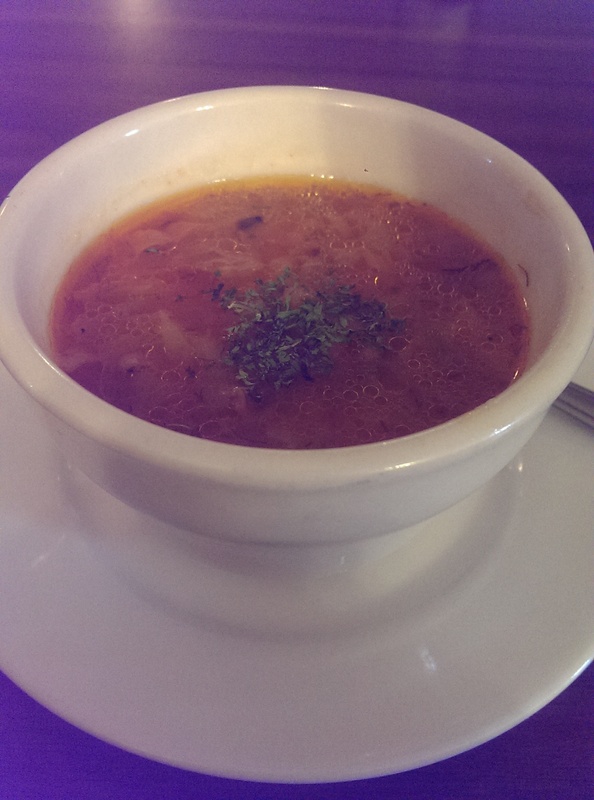 The cabbage soup was the absolute highlight for me. It was simple, but had a great flavor to it. I definitely could have eaten a bowl of it. I wasn’t too keen on the choice of Pepsi, especially because I was so thirsty and there was no air conditioning (only fans). Next time I’ll ask for water as well. The potato pierogi were indeed creamy, almost slippery in texture. They were obviously homemade and were very light. They weren’t as good as Sokolowski’s, but whose is? The potato pancake was delicious as well, and I didn’t really need the requested sour cream. The food that is served varies, but the kielbasa and stuffed cabbage appear to be a constant. 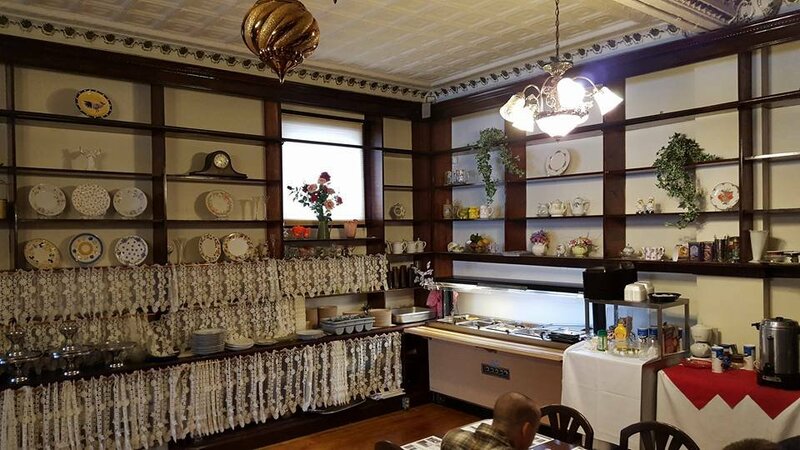 The buffet was in a little corner and featured some small stuffed cabbage, some meatballs of some sort, what I think were broasted chicken thigh, kielbasa and sauerkraut, mashed potatoes, spaetzel, and super-dried-out mixed vegetables. 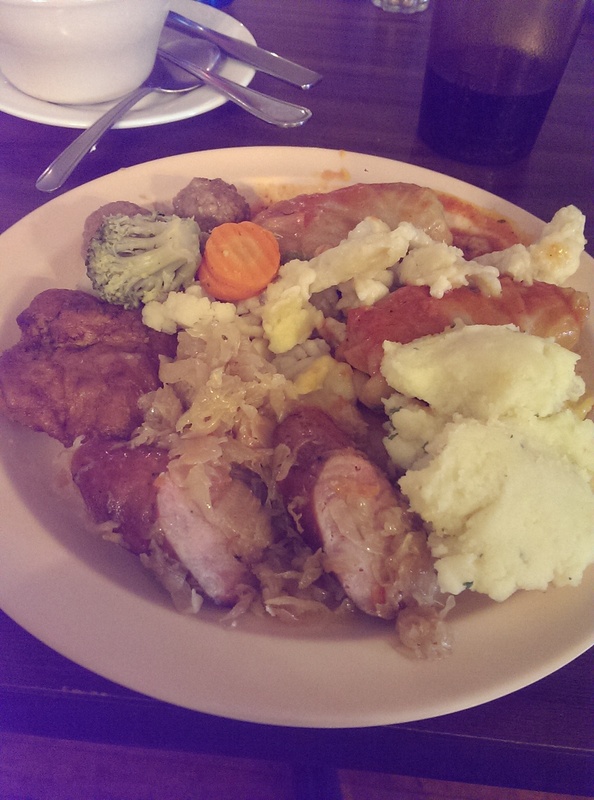 I particularly enjoyed the chicken, stuffed cabbage and kielbasa. I had filled my plate and my eyes were actually larger than my stomach. I did not go back for a second round and could barely finish the first one. 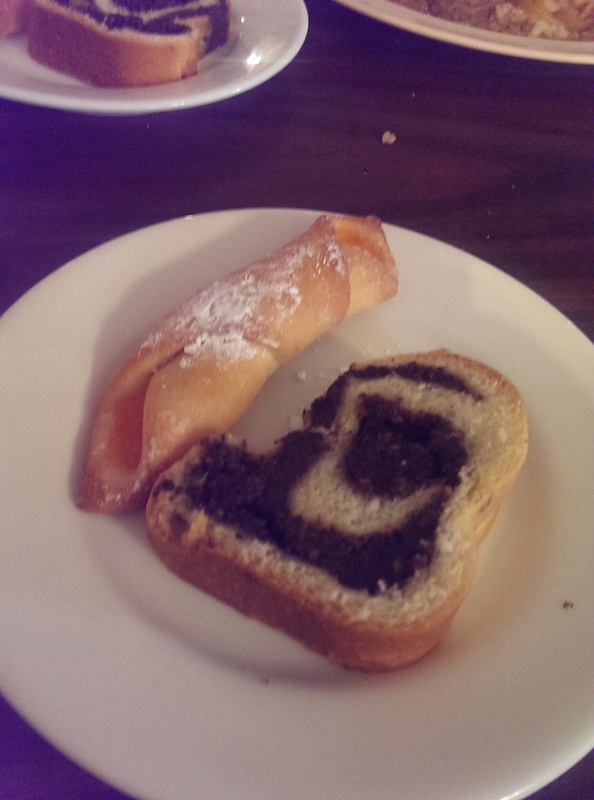 After we were finished they brought us a small plate of Polish pastry, which I wrapped up and took home for later. I particularly enjoyed the poppyseed cake. Like I said, pricing is hit or miss. It’s cash only, and you pay at the register when you are done. We paid $14.99 while others have reported paying $8.99 for the same experience. It’s a mystery. That said, it’s still a steal with the amount of food you get for the low price.